Saitō Toshimitsu (1534–82) was the principal retainer of Akechi Mitsuhide (1526–82). Under the light of the full moon, Toshimitsu is inspecting the Kamo River in Kyoto, wearing full armour and holding his chief weapon, the 'naginata' – a long spear with a curved blade. 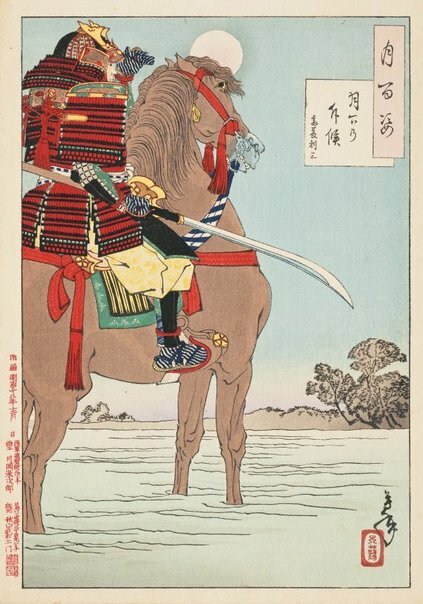 It is 1582 and he is preparing for a revenge attack on the Honnōji Temple where Oda Nobunaga (1534–82), the warlord who was Mitsuhide’s archenemy, had his headquarters. Nobunaga was caught in a trap at the headquarters and killed. Toshimitsu was later captured by Nobunaga’s followers, but escaped and became a monk.